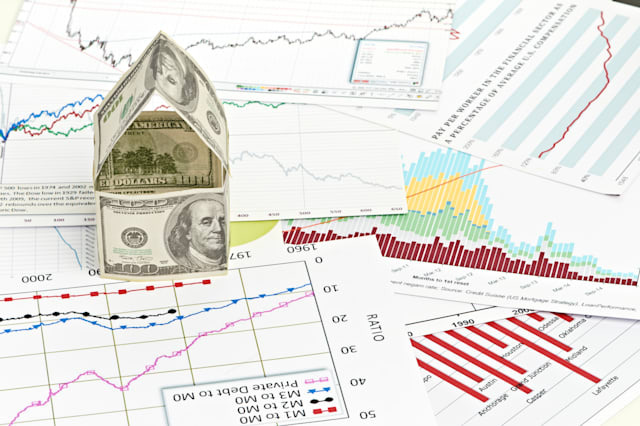 ShutterstockIt's been a mixed bag of economic reports for the housing market recently. The wind might be shifting in the housing market. The Commerce Department reported Thursday that new home sales tumbled 8.1 percent last month to a seasonally-adjusted annual rate of 406,00 -- the slowest pace in three months. What's more, May's numbers were significantly revised downward. "These numbers are drastically disappointing; it doesn't build an optimistic picture in the near-term for the housing market, which used to be a headwind for the economic recovery," Edison Byzyka, vice%VIRTUAL-pullquote-"There is some good news: Inventory of new homes for sale are up 20 percent year-over-year," % president of investments at Hefty Wealth Partners said. It's been a mixed bag of economic reports for the housing market recently. Earlier this week, existing-home sales showed strength in June, rising 2.6 percent to a seasonally-adjusted annual rate of 5 million, according to the National Association of Realtors. This was the third consecutive month of increases, and the fastest annual pace since October. Last week, home construction skidded 9.3 percent, the second consecutive month of declines and the weakest showing since September 2013. This news came out the day after data showed homebuilder confidence was sitting at a six-month high. New home sales make up nearly 10 percent of buying activity in the market. While Jed Kolko, chief economist at Trulia, calls Wednesday's numbers "disappointing" he points out the report can be highly volatile and have a large margin of error. "New home sales are down 5 percent year-over-year, which is a clear sign that new home sales have slowed.... But there is some good news: Inventory of new homes for sale are up 20 percent year-over-year," he said. Adding to the complicated picture, first-time buyers have been noticeably absent from the housing market in the years following the end of the Great Recession. According to Tom Showalter, chief analytics officer of Digital Risk, this demographic historically makes up about 40% of home sales. Right now, that number sits at 28 percent. Kolko said first-timers don't normally make up the bulk of new home sales. "New homes right now are larger and tend to be built at the higher-end of the market. Most new buyers are looking for something more affordable," he said. Byzka added that when you combine strict lending rules and a lack of available homes that pushes up prices, affordability is hard to come by in this market. He went on to say that lack of full-time employment among the millennial generation is weighing down household formation. "Nearly half of those in this demographic are part-time or underemployed. They don't have a strong enough income to purchase a home. For me to go ahead and buy a bigger home, I need a first time to come in a buy my home. And they just aren't doing that. So it clogs the system," Byzka said. Wages haven't been keeping up with the price acceleration, according to Showalter who said the real median household income was $57,000. Now it's dropped to $51,000. Despite that, some markets have maintained their energy coming off 2013's growth -- especially areas in Northern and Southern California, Miami, Texas, New York City and Washington, D.C. But markets in the Midwest and Southeast are still struggling. "You can't walk three block in Dallas without running into someone building a home. But then parts of the Midwest and Southeast are the exact opposite. We have a bifurcated market, the haves and the have-nots," he said. While Thursday's report shows the recovery is failing to build momentum, Byzka said there's a bigger problem on the horizon: boomer homeowners." Boomers are retiring in droves, and they are going to want to downsize from their monstrous 4,000 square-foot home with six bedrooms and four bathrooms. The problem is, younger buyers just aren't that interested in that," Byzka said.